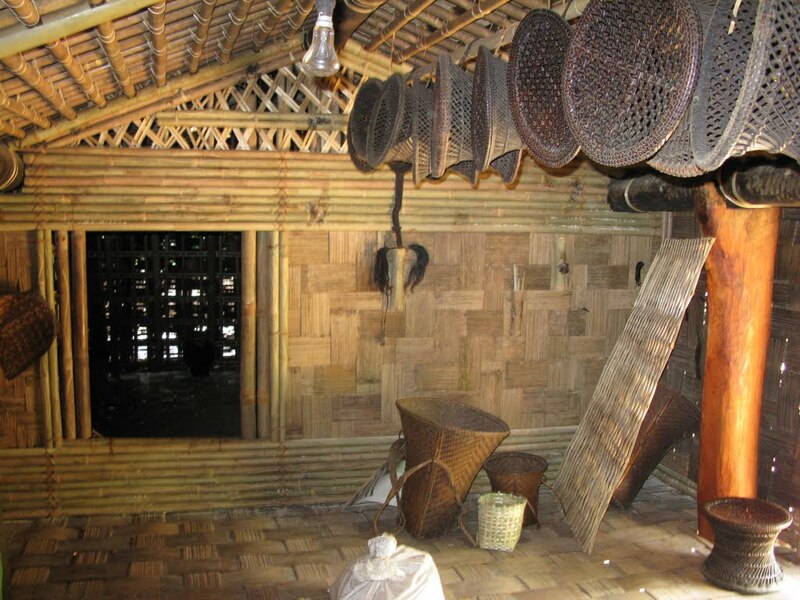 Garo houses are built by the members of the Garo tribe, using locally available resources such as bamboo, timber and cane. These houses serve a variety of purposes, including serving as granaries or bachelor’s apartments. Built using hand tools during the dry months, the houses are found predominantly in the West Garo Hills district, in Rongram region, Sadolpara village, and Sasatgre village. The closely knit Garo tribe builds houses out of locally available natural resources such as bamboo, cane, timber, wood from rubber trees, and dried palm leaves. The process of building these houses is done the traditional way – each man builds his own house, with the help of his family and fellow villagers. The main construction work is given to youngsters and is used as an on-hands training exercise. This is done to ensure that each member of the tribe learns the art perfectly so as to pass it on to future generations. The timber and bamboo required for construction are carefully selected from the forests in the region. Strong bamboo, cane, and rubber tree woods are collected, checked for abnormalities or damage, and cut into desired shape, size and thickness. The wooden stumps are cut using saw. Bamboo and cane are cut into sticks with a bill hook knife, and treated by soaking in water to make the splits malleable. Once the raw materials are ready, wooden posts are constructed on which the bamboo house rests. These posts vary from 10 metres to 45 metres in length, and 3-7 metres in width. The striking feature of the houses is the extensive use of bamboo in every part of it, including the wall frames and room dividers. The bamboo splits are held together using jute ropes and dried bundles of palm leaves. Flattened bamboo boards are used to strengthen the wall panels, while whole bamboo sticks provide extra support. The floors are made with bamboo mats, reinforced with flattened bamboo boards. Each Nokmong/ Nokachik house has a living room called dongrama, that has a fireplace. The construction of the fireplace is done very carefully since the whole house is built of highly inflammable material. The centre of the fireplace has a mud plinth, and a smoking shelf placed above it. This shelf is designed to hold baskets and food items warm. Sanitary facilities such as toilets are attached to the living room. The other rooms include bedrooms, kitchen and a porch, on which women pound rice. The rooms are arranged in a long stretch between an open porch and a verandah, and at ground level is built a cow shed to house the family cow. Specific types of bamboo houses are built for specific purposes. The Nokpante is a bachelor’s dormitory, where youngsters live in close quarters of their tribal chief, who teaches them arts, cultivation and life skills. 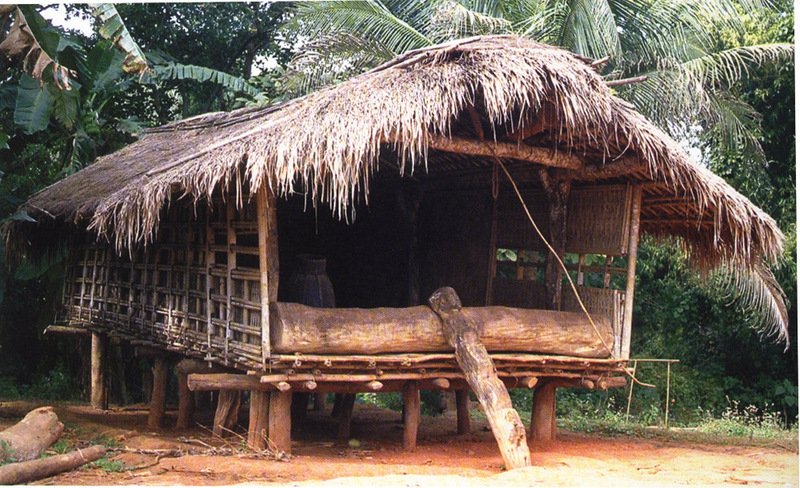 The Jamsreng or jamap tpe of bamboo houses are used to store seasonal fruits or grains, and occasionally slept in. The Jamatal are miniature houses built in the middle of fields. These are also constructed on tree top to protect the inhabitants from wild animals. 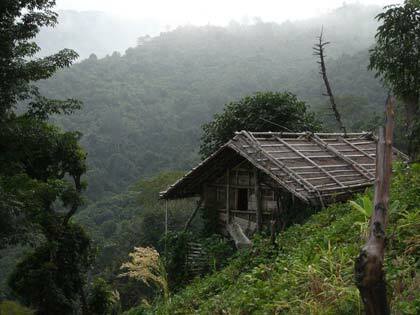 These houses are accessible by ladder and are called Borang, meaning house on the tree top. The closely knit Garo tribe builds houses out of locally available natural resources such as bamboo, cane, timber, wood from rubber trees, and dried palm leaves. The process of building these houses is done the traditional way – each man builds his own house, with the help of his family and fellow villagers. The main construction work is given to youngsters and is used as an on-hands training exercise. This is done to ensure that each member of the tribe learns the art perfectly so as to pass it on to future generations. Bachelor’s dorms are built for young students, while granaries and field houses have their own specific purpose. That’s really a great information. Thanks for sharing it.